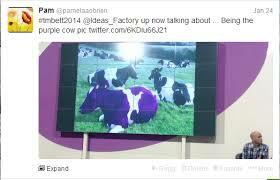 Teachmeet BETT 2014 – bigger may not always be better? 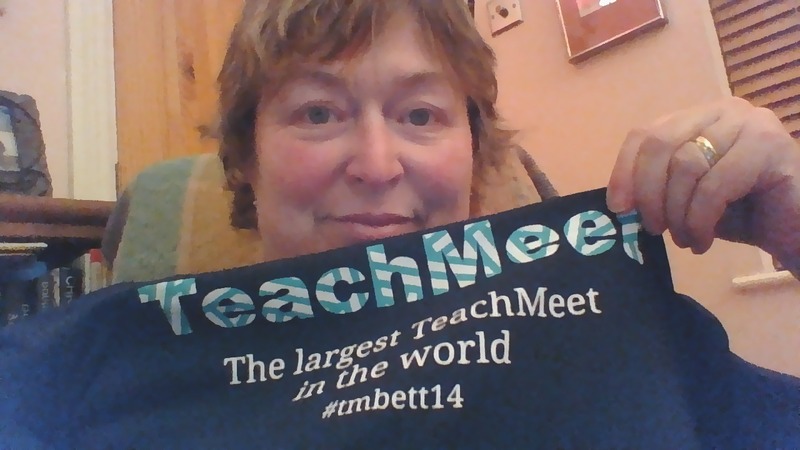 There’s me wearing my cool TeachMeet Bett T-shirt (love it, thanks organisers and sponsors TES – though sorry to see no TES at this BETT show). I won’t list the presenters as others have done so in great blog posts already – see super posts from Pamela O’Brien, Helen Bullock, or Kate Murray (& Larry Leprechaun!) for details. 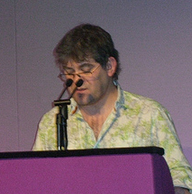 The front two rows of the BETT arena contained the Irish delegation, or the Fellowship of the CESI ring as Bianca Grogan calls it – Nigel Lane, Pam, Hellie, Bianca, John Heffernan, Sarah Jane Carey, Kate, Kathleen Buckley, Pat Seaver, Rory McGann and Fred Boss were spotted tweeting and hooting. (Hellie was taking note of everything in detail – watch out for some fireworks at TeachMeet CESI in the Clayton Hotel in Galway on February 28th! I know that feeling, Hellie, watching another TeachMeet is like looking in another teacher’s room for helpful ideas). It was strange to be in rows instead of in the round – very little wriggle room – very little cross table eye contact – I missed those. Still, the audience was very receptive to all the presenters, and we had some great, thought provoking, presentations for sure. I loved the presenter Bingo that ran though the evening, made for good fun, prompts to remember who was who, and was handy to jot down notes when the phone battery died. I loved the cartoonist team who ‘live graffiti-d’ the entire evening for us – the final wall is here at Fred Boss’s Vine. What did I found myself noticing after about the first hour however? I was feeling a little uncomfortable. Physically – sitting squished between two other people, no matter how much I love them, is not my idea of a learning space. Professionally – as a TM junkie, and an erstwhile TM organiser this side of the pond, what I love about TM most of all is the ever-so-slight-anarchy that can reign, especially during break-out sessions which I guess were not possible in this TM. I appreciate the amazing work put in by volunteer organisers Drew Buddie, Ian Usher and team; but I just couldn’t keep away the thought that with a TM this big, it was always going to be what it turned out to be – a very linear bunch of macro presentations followed by a very linear bunch of nano presentations. The quality of each presentation was top notch, as was the calibre of those in the audience; I just couldn’t help thinking each presenter deserved a less jaded arena. The idea to have a gigantic TM is still a great one, but the format will need upsizing. And though the above sounds like a rant or a moan, it truly isn’t – I am still glad I went, I totally appreciate everyone’s contribution, and for me TeachMeet still rocks!!! 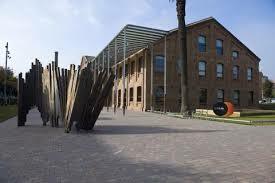 The first European Scratch Conference at Citilab, Barcelona at the end of July 2013 was a unique experience, spearheaded by Joek van Montfort (@xota). Joek had visited us in Ireland at CESI conference weekend and Dojocon, and it was his drive that attracted us to the conference. The CESI Executive dispatched myself and John Hegarty to attend. We were not sorry, and it was great to get there and find that Ireland was so well represented. Our self-styled “Fellowship of the Fáinne” included @saorog, @jhegarty, @magsamond, @digitalmaverick, @groganbee, @snicreamoinn, @jwhelton, @rorymcgann1, @eugenemcd and @ycmcinerney. Clare and James were both keynoting, I was on an Ignite bench and as ever Stephen was apparating everywhere (and as ever his Kinect, Leap and Scratch joie de vivre drew an appreciative crowd where e’er he showed his wares). Pedagogically this was a very serious conference. Both Mitch Resnick and Karen Brennan of Scratch MIT were keynoting, and one exercise involved the whole audience offering their mini SWOT analysis (ok SWOT/SCOT, grams/ ounces, tomato/tomahto – some day we will get both sides of the Atlantic in sync.) to be collated. The results are on the MIT Scratch.ed site. They make good reading. If you check out the 4 min vid on YouTube you may spot at least Mags, John, Clare and Stephen among the faces and voices. The Twitter stream, (which trended in Iberia at least for part of the weekend of the conference) #Scratch2013BCN, is still live and ticking. So what did I talk about? It was titled Scratchin’ at the Crossroads for more than one reason. 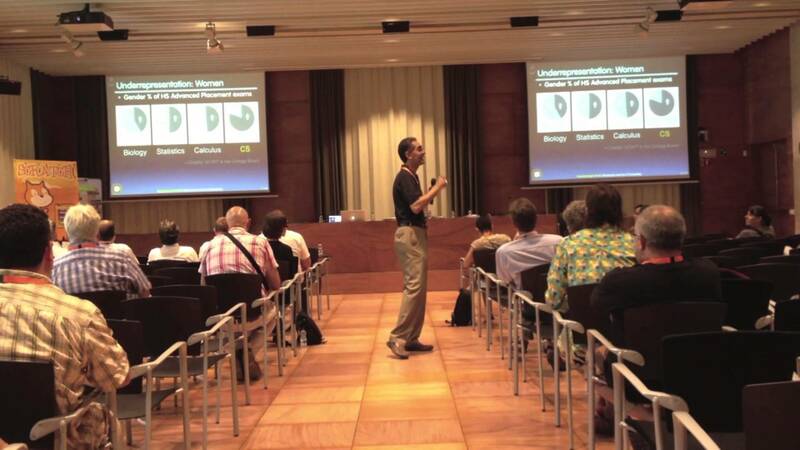 I was wearing several virtual hats – second level teacher, Coderdojo mentor, CESI volunteer. In school I have found Scratch to be a terrific tool to bring students together in the Computer Lab – it can be quite solitary otherwise – and for a dyed-in-the-wool Cooperative Learning advocate that can only be a good thing (my apologies to David and Roger Johnson, my reference to you fell off slide 6). It has given my students confidence to step across a threshold into coding they might otherwise have shied away from. Scratch is also at the interface of other areas in Irish education – we are about to introduce Programming to our official school curriculum across the whole country, and Scratch is definitely going to help non-coding teachers across that scary threshold. Scratch is also an element in a lot of Coderdojos in Ireland, and while it has its equally zealous advocates and adversaries, it is there to stay so it is important that we use it to its full potential. (and did I fit all that into a 5 minute Ignite talk? I did – I can talk almost as fast as @saorog when I need to.) It is here, with the other Ignite talks. I haven’t watched it yet…what is it about hearing and seeing oneself? Eeuugghh. Drew Buddie’s (one of three presentations he brought) idea of embedding Jesse Schell’s Learning Lenses into Scratch lessons. Drew won the admiration of the entire audience for delivering a riveting lesson even though every possible piece of tech (wifi, projectors, computers, cables) failed to work. It was a beautiful lesson, both the content, and the delivery. Thanks for the inspiration Drew! the youngsters of the Tech Volunteer team led by mentor Margaret Low @megjlow – they brought the house down with their giant human sized walk through of a Scratch program, which was central to their story of helping young students think their way through programs. I am sooooh stealing this idea. 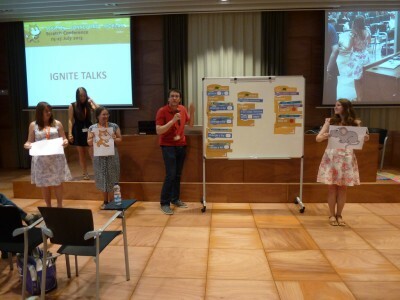 Watch the end of the Ignite talks above to get a flavour of the fun. Dan Garcia‘s talk was titled “The Beauty and Joy of Computing“, but any teacher in the room would have called it “The Beauty and Joy of Being in the Classroom of a Gifted Teacher”. Period. It was a wonderful presentation of a wonderful story of the transformation of CS in Berkley using interventions including Scratch’s nerdy cousin Snap. I want him on tap, here, now, in Ireland. And the was fun in the learning at the conference. People were still teaching and teching and hacking and sharing over coffee and tapas at every break, and over dinner each evening. The wonderfully hospitable Catalan teacher Frank Sabaté (@franksabaté) took a huge group on a walking tour of Barcelona on Wednesday night. Our Fellowship had a great Thursday evening of tapas and beer in the city in the company of the sartorially unique @digitalmaverick and fellow Scot Peter Donaldson. While we were in Citilab the MakeyMakey addicts got us all to gather and hold hands to complete a human circuit – there we are pictured above, ready for the Guinness Book of Records, miaow!